There are numerous levels of AKC Rally® titles that can earned by dogs. Even dogs that aren't registered with the AKC can participate. All their owners need to do is obtain a PAL/ILP number from the AKC through an application if the dog appears to be purebred. 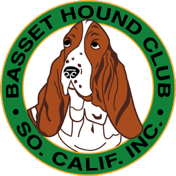 The BHCSC holds AKC Rally® competition for basset hounds at it's BHCSC Specialty Shows in March. The information below may help you understand this program. You can also find AKC Rally® information on the AKC website. The AKC caught up with competitors at the first AKC Rally® National Championship to hear their thoughts about the sport of AKC Rally®. Learn why dogs love the sport, find out how to get started and watch some competitors in action! An AKC produced video on YouTube included here with permission from the AKC. AKC Rally® is a fun competition event that was created by the AKC to provide all dog owners a chance to compete with their dogs. It combines elements of obedience and agility but is far less formal. The emphasis is on training your dog and having fun. This page links to other AKC website pages that tell all about the sport. This pdf file is a beginning introduction to AKC Rally. It mentions the very beginning steps necessary to compete. Webmaster's Note: I hope to be able to continue this series of pdf files on AKC Rally for basset hounds. At present I'm in need of photograps of some signs and basset hounds participating in these events. 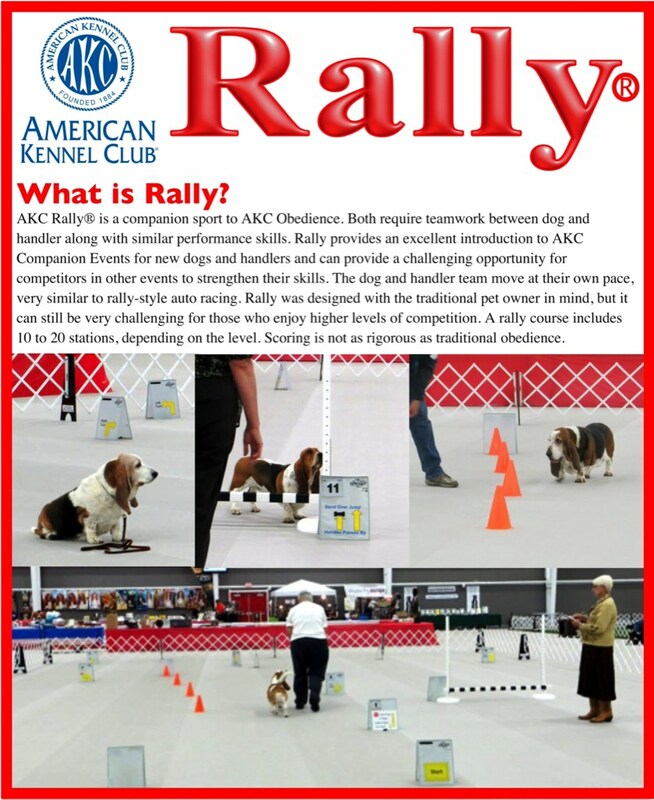 This pdf file shows and explains some of the basic signs and activities for AKC Rally. It gives the beginner a place to start understanding how Rally works. This pdf file shows and explains some of the more advanced signs and activities for AKC Rally. It goes a little farther than the basic signs. These tasks are where Rally starts getting challenging, but more rewarding too. Handlers and dogs must work as a team. It's important to remember when looking at these that, unlike obedience the handler can give both voice and visual commands during Rally events. AKC Rally® is a registered trademark of the American Kennel Club, Inc. (AKC). All dogs can participate in Rally as well as most other AKC events. This is the story of a lady, Jean and her dog, Coco, at the AKC Rally National Championship. Jean talks about her story of rescuing Coco and the journey to the Rally Championship. It shows what rescued dogs can do in AKC events.